This is another blog post by my friend Eloise... I asked her to write about overhearing this conversation because it shocked me so much!! It was a very bad day in audiology today. Not for me, but for a girl who looked to be the age of around six or seven waiting with her mother to go into an appointment. “Mummy, please let me have the pink hearing aids,” she said, swinging her legs off the chair. She was pretty with brown, slightly curly hair which came past her shoulders. Her mum was also quite pretty but oozed pretentiousness throughout the situation. The little girl sat quietly, still swinging her legs around. She looked at the TV but the mumbling of the news could not keep her distracted for long. At this point, I had become so angry and upset at the mother’s attitude that I had to switch my own hearing aids off. 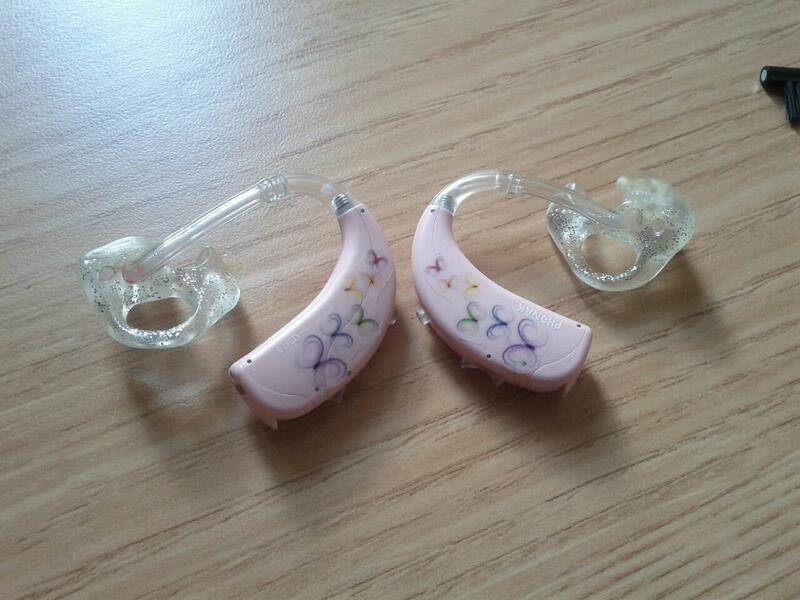 My hearing aids are pink with glitter moulds, blue tubes and butterfly stickers – and I’m eighteen years old. The fact that I can decorate my hearing aids gives me a sense of pride and identity as a young deaf person. It seriously upset me that this little girl could not get the ‘fairy ears’ that she desperately wanted. That small dream would have been in reach had her own mother let her have them. Instead, her mum, only concerned about appearances, forbid her own child from having the colour and design she so wished for. "Eloise's hearing aids before blue tubes!" Please share your opinions on this situation. What would you say to the mother and the little girl? I certainly know what I’d say, and the mum probably wouldn’t like it! If I'd would have heard that, I would have gone over and showed of my pink ear gear and said I may be an adult but showing them off makes other people aware I am deaf, and reflects my personality and mood I feel today. There is no shame in being deaf. Only pride. I totally agree, i think in order for people to have confidence and actually wear their aids they need to have the colours etc to make them feel proud of their aids. not like they should have to hide them! thats terrible. That is such a sad story- I've only just discovered the joy of decorating my daughter's implants but she LOVES it! I certainly would never have refused to let her have 'fairy' ears if she'd wanted them, it's so important that she enjoys wearing her implants and is confident with them. She recently started school and is totally confident about telling other children what they are for - long may it last! I used to be a primary school teacher and one of the parents used to ask for her daughter's hearing aids to be removed for school photos - what kind of message was she sending her daughter?! That is so sad, what a horrible message for that little girl. My daughter is 3 and has bright purple/pink aids with glittery moulds. When we got her aids we did debate getting pale pink or tan so they'd be less obvious but decided it was much better to be proud and let the world see them. What a cow! I think I would have made a big show of looking at my ten year old hearing aids and discussing the purple aids with the butterfly picture in the mould very loudly. Poor child isn't going to have any confidence about her aids is she? Why should she hide them? They're part of her! It just shows what a mountain we have to climb to overcome such prejudice. That makes me so sad :(. HEART BREAKING! This story brings tears to my eyes. All the poor little girl wants is to show how special she is and her mother is just so tragically blind that her daughter will most likely grow up to be ashamed of her hearing loss. How can you say no to such a sweet and innocent request? Iam purely astounded at such a close minded mother. That mother sounds just like mine. I always had to keep my hair long as a child so i could cover my hearing aids so no one would know i had problems. Here i am at 33 and only recently have accepted that hearings aids are part of my life i can't change it so i my as well be open about it. I haven't quite got around to decorating mine yet but probably will. I have recently started training as a brownie leader and one if the girls in my unit wears aids, or rather she wears her aids more now after meeting an adult with them. In speaking with her mother i became aware that she was becoming reluctant to wear her aids as she like many children is the only one in her school with aids and doesn't like being so different. We are trying to give her more confidence she now at least wears them each week to brownies. If decorating the aids makes them more special to a child then i am all for it and will see if she would like to try it.